Stretched so thin for resources for so long, it is impossible for Amtrak to make meaningful improvements to the nation’s intercity passenger rail system in its current form. Thus, modernizing the Northeast Corridor, as well as the nation’s rail infrastructure as a whole, starts with modernizing the way our intercity passenger rail is designed, constructed, maintained, managed, and financed. In 1991, the European Union enacted EU Directive 91/440 and later implemented its First Railway Package in order to better promote the efficient development of European high-speed railroads and foster open access among competing operators. EU Directive 91/440 modernized Europe’s rail system by effectively requiring that European nations separate their railroad infrastructure management from their transportation operations. In practice, this meant keeping separate profit and loss accounts and balance sheets and publishing them individually for business relating to the provision of transport services and for business relating to the management of a railway’s infrastructure. Under EU Directive 91/440, public funding must also reflect this separation, and funds paid to one activity may not be transferred to the other. Today, European railroads have thrived with this regime of distinct infrastructure and transportation management. The separation of these traditionally unified tasks has allowed each entity to better focus on its specific and individual business purpose; a country’s development sector focuses on building its national rail infrastructure while an independent rail operator focuses on improving service on the newly developed track. In addition, without a direct tie between the infrastructure and transportation operations of a given country’s rail system, private operators have begun infiltrating traditionally government-run railroads. 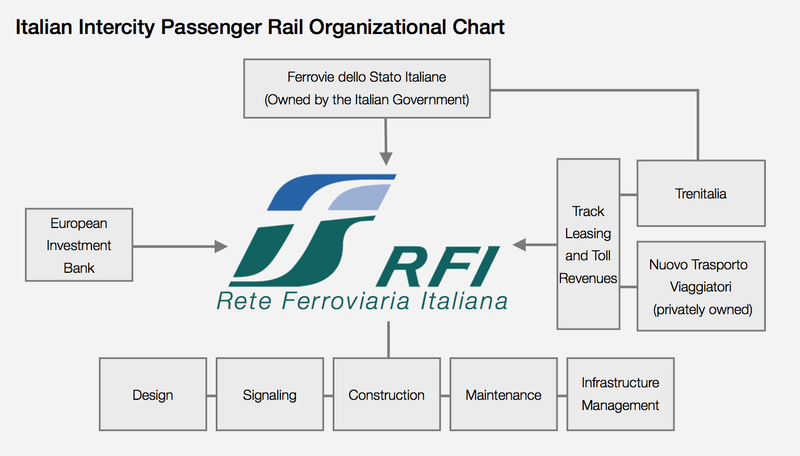 For example, in Italy, infrastructure management is overseen by Rete Ferroviaria Italiana while transportation operations are chiefly run by Trenitalia. Both entities are subsidiaries of the holding company Ferrovie dello Stato Italiane, which is wholly owned by the Italian Government. However, Italy is also home to Europe’s first private high-speed rail operator, Nuovo Trasporto Viaggiatori, which began service in mid-2012. In its first year of operation, Nuovo Trasporto Viaggiatori lost approximately €77 million ($104 million), although revenues and ridership beat expectations. More importantly, however, the separation of infrastructure and transportation management within Italy allowed Nuovo Trasporto Viaggiatori to exist despite state- ownership of the rail infrastructure. On the other hand, Trenitalia, without having to allocate revenues towards the construction and maintenance of its underlying infrastructure, earned approximately €1.5 billion ($2 billion) in profit last year on revenues of €5.5 billion ($7.4 billion) with a gross margin of approximately 27%. 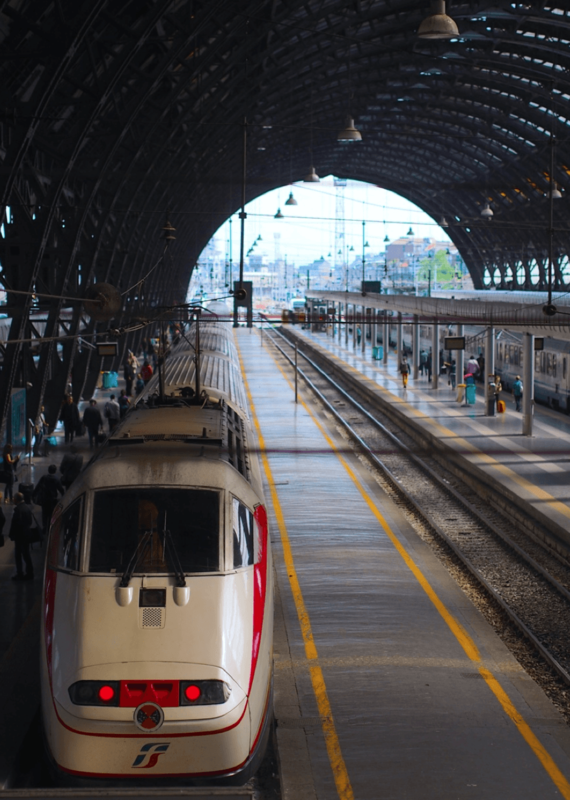 The creation of open access across Europe’s vast rail network will, in the long run, benefit passengers from increased diversity of choice, efficiency in operations, and overall service quality. In contrast to the separated organizational structure of European railroads, Amtrak’s dual-purpose organizational structure has limited its effectiveness in both realms. Amtrak’s transportation operations contain several profitable or near-profitable routes that have seen tremendous growth over the past two decades. Amtrak’s infrastructure management and development operations, on the other hand, has never operated at a profit. As a result, Amtrak must pull revenues from its transportation business in order to fund infrastructure improvements. Put another way, but for its capital expenses, Amtrak would be able to direct its profits exclusively towards improving passenger service. Amtrak’s dual-purpose organizational structure also hurts its capital expense subsidy. Because its transportation services operate at a net loss, Amtrak requires federal subsidies to close its yearly deficits, which in turn reduces the share of total federal funding going towards infrastructure improvements. In addition, since Amtrak’s infrastructure and transportation operations are managed by the same entity, a large portion of Amtrak’s capital expense subsidy goes towards non-infrastructural improvements such as locomotive procurement and cabin modernization. In 2013, Amtrak spent nearly $1.1 billion on capital projects, for which it received $642 million in dedicated federal subsidies. Of the $1.1 billion in capital spending, only $472 million or 45% was spent on track-related improvements, with the remainder going towards largely passenger-related improvements. Over the next five years, Amtrak has budgeted $11 billion for capital projects. It hopes to obtain $6.5 billion in federal subsidies to cover a portion of these costs, even though this would amount to more than twice the funding it received for capital projects in the previous five years. Amtrak also anticipates using $1.5 billion in operating profits from the Northeast Corridor to finance capital projects throughout its entire system. Among these projects are over $1.4 billion in capital funding for Amtrak’s long-distance service, including items such as the purchase of new sleeper and dining cars. The lack of a dedicated, reliable income source for Amtrak’s infrastructure improvements has resulted in historic underfunding and delays in making much-needed capital investments. Before any meaningful improvements can be made to the Northeast Corridor, Amtrak must follow the example the European example of separating its infrastructure management from its transportation operations in order to create two independently-focused entities with distinct financial and organizational structures. Similar in the way that Amtrak oversees capital and maintenance expenses for the country’s passenger rail system, the United States Department of Transportation (namely the Federal Highway Administration) oversees capital and maintenance expenses for our nation’s surface roads and highways. The USDOT pays for highway projects, usually in the form of state and local grants, by drawing monies out of the Highway Trust Fund. And much like Amtrak’s financial circumstances, the Highway Trust Fund operates at an annual deficit. 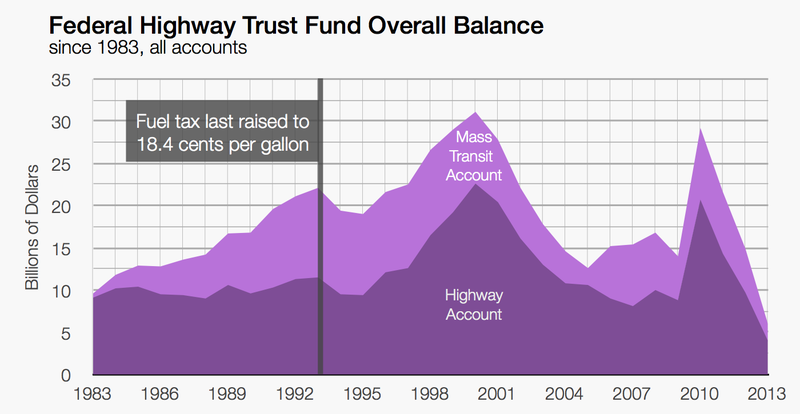 Since the mid-1950s, the Highway Trust Fund has earned revenues primarily from excise taxes, which were last increased in 1993 to 18.4 cents-per-gallon on gasoline and ethanol-blended fuels and 24.4 cents-per-gallon on diesel fuels. 2.86 cents of each of these taxes goes towards the mass transit account of the Highway Trust Fund, which finances local and regional transit projects, with the remainder going towards the highway account of the Highway Trust Fund. If these taxes were adjusted using the consumer price index, the tax on gasoline today would be about 30 cents per gallon, and the tax on diesel fuels would be about 40 cents per gallon. In other words, the purchasing power of today’s excise taxes are only 62% of what they were in 1993. In 2013, the highway account of the Highway Trust Fund started the year with a valuation of approximately $15 billion. Revenues totaled $43 billion, including $32 billion from highway account taxes, $5 billion from mass transit account taxes, and $6 billion in federal highway subsidies. Outlays totaled $50 billion, including $43 billion in spending on highways and $7 billion in spending on mass transit. In total, the Highway Trust Fund lost approximately $7 billion exclusive of interest and other losses. By the end of 2013, the highway account’s balance had dipped to just $4 billion and the mass transit account’s balance had dipped to just $2 billion. Like Amtrak, the Highway Trust Fund has relied on congressional appropriations in order to subsidize its annual deficits and replenish the fund. Over the past ten years, outlays from the Highway Trust Fund have exceeded revenues by more than $52 billion (not including federal subsidies). Further, excise taxes only cover an average of 50% of highway spending with the remainder coming from non-user fees such as federal subsidies. If spending continues at the current rate, over the next ten years, the Congressional Budget Office estimates that outlays will exceed revenues by $167 billion through 2024. In order to remedy these deficits, over the past five years, Congress has transferred $54 billion to the Highway Trust Fund, mostly from the general fund of the Treasury. In 2014, Congress appropriated another $11 billion to the Highway Trust Fund by way of legislation allowing for the deferral of pension payments, which would in turn raise more tax dollars in the short-term. Under this most recent plan, the Highway Trust Fund would remain solvent only through late-2015. The rising deficits and instability of the Highway Trust Fund can be attributed, in part, to rising fuel efficiency, a decreasing numbers of drivers, and the decreasing impact of the fund’s fuel taxes relative to inflation. If the various excise taxes were automatically adjusted to keep pace with the consumer price index, for example, revenues would be much higher relative to annual outlays. In addition, the lack of a dedicated, multi-year federal subsidy has also created uncertainty in terms of long-term project planning and funding mechanisms. While reasonable minds may differ on how to resolve this current challenge (reduced spending vs. increase federal funding), it is clear that the status quo for funding the Highway Trust Fund is unsustainable. Any future infrastructure management entity charged with improving the Northeast Corridor must avoid the funding challenges that have plagued the Highway Trust Fund. To that end, this means ensuring long- term, renewable sources of funding that are not reliant on political whimsy and requiring responsible fund management to avoid potential insolvency. The United States has, for too long, relied upon a hodgepodge of uncoordinated and unrelated funding mechanisms for its large-scale infrastructure projects. For instance, the FRA administers over a dozen grant programs alone, each of which has its own limits and application criteria. Further, despite its breadth of grant programs, the United States lacks a streamlined source of financing for its large-scale infrastructure projects. In Europe, on the other hand, the chief source of financing for its infrastructure projects has come from a public/private investment bank that has been very successful at catalyzing funding for the sorts of capital investments that often struggle to get off the ground in the United States. Founded in 1958, the European Investment Bank (“EIB”) is a non-profit lending institution tasked with policy-based lending towards the economic and social advancement of the European Union. The EIB’s shareholders are the various member states of the EU, who drive the policies that shape the bank’s lending practices. With an AAA credit rating and capital levels around $400 billion, the EIB has played a pivotal role in not only investing in large-scale European infrastructure projects including high-speed rail, but also attracting ancillary investors through mutual participation agreements. The EIB requires that loan recipients satisfy stringent lending criteria, and loans typically cover 5% to 30% of the total project cost. Over the past several decades, the proportion of federal funding for infrastructure projects has steadily decreased. Under the Interstate Highway Act of 1956, federal grants routinely funded 90% of a given interstate highway project’s construction costs. Starting in the 1970s, capital grants under the Federal Transit Administration’s New Starts program typically funded up to 50% of eligible transit project costs. Today, significant grant funding for any project, let alone intercity passenger rail, is harder and harder to come by. In order to ensure a steady source of funding for future projects, the United States should follow the European example by forming its own national investment bank aimed at financing, among other ventures, the improvement of our transportation infrastructure. Like the EIB, the American Investment Bank will fund infrastructure projects with below market-rate loans, which in turn will incentivize complimentary private investments. The United States took a step in the direction of establishing a national infrastructure bank with the enactment and implementation of the Transportation Infrastructure Finance and Innovation Act of 1998 (“TIFIA”), which provides federal credit assistance in the form of direct loans, loan guarantees, and standby lines of credit to finance surface transportation projects of national and regional significance. TIFIA credit assistance has improved access to capital markets by providing flexible repayment terms and more favorable interest rates than can be found in private capital markets for similar instruments. Today, a typical 35-year TIFIA loan has an interest rate of around 3.4%. TIFIA direct loans can fund a maximum of 49% of a project’s total cost, and TIFIA lines of credit can fund a maximum of 33% of a project’s total cost. Overall, TIFIA projects cap total federal assistance from all sources at 80% of a project’s total cost. Because the TIFIA application process requires project sponsors to meet a number of stringent criteria for revenue generation and credit-worthiness, TIFIA projects also incentivize private investment. In practice, each dollar of federal grant funding can provide up to $10 in TIFIA credit assistance and leverage $30 in transportation infrastructure investment. TIFIA has provided $7.9 billion in credit assistance for 22 projects since 1999, which in total represent $29.4 billion in infrastructure investment. 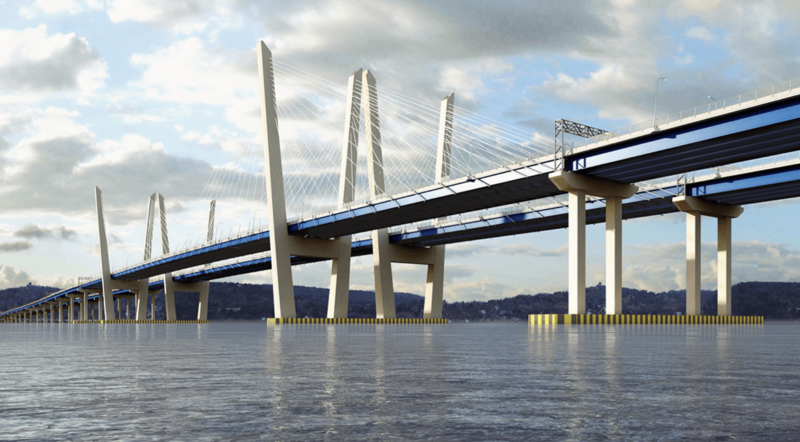 One example of TIFIA’s ability to catalyze and streamline project financing is the recent start of construction on a new Tappan Zee Bridge over the Hudson River. After decades of delays and false starts, in September of 2012, the United States Department of Transportation approved a plan to replace the existing Tappan Zee Bridge with a new dual-span bridge north of the current structure. NEPA approvals took just ten months, instead of several years, because the Obama administration designated the Tappan Zee Bridge replacement as a high priority project, which enabled the fast-tracking of environmental impact review and permitting processes. Of the $5 billion total project cost, $1.6 billion (approximately 33% of the total cost) was financed by a direct TIFIA loan, which will be repaid by New York State Thruway Authority’s (“NYSTA”) system revenues. Under the terms of the closing, the NYSTA will not begin to draw on bridge proceeds until early 2019 and will not make any repayments until 2024. The closing of the TIFIA loan came one day after the closing on the sale of $1.6 billion in five-year bonds to help finance the project. The NYSTA developed an innovative new credit structure to use the TIFIA loan proceeds to pay off the $1.6 billion in short-term bonds, for which there was strong market demand at a significantly lower interest rate than the 35-year TIFIA loan. The remaining project costs will be financed by toll-backed bonds and notes issued by the NYSTA. The new Tappan Zee Bridge project is just one example of how a national investment bank can help advance qualified, large-scale projects that otherwise might be delayed or deferred because of size, complexity, or uncertainty over the timing of revenues.